The South Bay F.O.R. 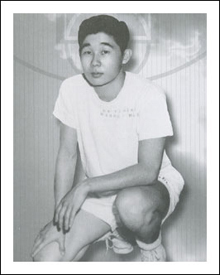 (Friends of Richard) began in 1959 in commemoration of Richard Nishimoto, an athletically gifted Japanese American. Richard excelled in many sports through high school and during his first year of college before his untimely passing at age 18. F.O.R. originally started with 15 boys and 8 officers as a service organization and baseball team. F.O.R. eventually expanded to basketball and again expanded by adding a girl's division to its current participants, now numbering over 1,000 boys and girls ranging in age from 5 years through high school and adults. Many present and past players are now parents, coaches, officers and supporters of the South Bay F.O.R. Junior Sports Association 501(c)(3), a non-profit charitable organization.